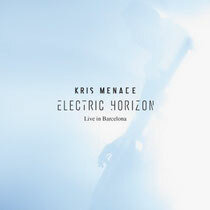 Kris Menace releases his first live album this month – Electric Horizon Live In Barcelona - which was recorded in Spain at the Razzmatazz Clubs in Barcelona. The sold out show marked the release of the 'Electric Horizon' album and featured an exclusive live rendition of his debut single 'Discopolis'. Kris released his first album 'Idiosyncrasies' in 2009, 'Electric Horizon' in 2012 and quickly followed by his all vocal album project 'Features'. 'Features' included collaborations with Julian Hamilton from The Presets, Miss Kittin, late Daft Punk collaborator Romanthony, Robert Owens and German soul singer Xavier Naidoo. Kris has also worked with Depeche Mode, LCD Soundsystem, Air, Royksopp, Underworld, Booka Shade, Metronomy, Moby, Kylie Minogue and Lana del Rey. Well-respected amongst the dance community, Kris is currently signed to some of the most influential labels in the world, while also behind projects such as Black Van (DFA) or Stars On 33 (Eskimo). It’s out 24 June on Compuphonic.